The bright star, b Persei is a known triple system. The inner pair of stars are locked in a close orbit about one another, with an orbital period under two days. They're close enough that they exhibit ellipsoidal variations, and precise photometry (1-2 percent) can detect the rapid, sinusoidal variation of this pair. But it wasn't clear what the third star in the system was doing. Optical interferometry by Robert Zavala at the US Naval Observatory and Jason Sanborn of Lowell Observatory clearly showed the third component in the system, and also suggested a possible eclipse of the inner pair every 700 days. AAVSO observer Don Collins (Professor Emeritus, Warren-Wilson College) has consistently observed this system over the past few years beginning with a DSLR camera, and contributed to the observations of the 2013 eclipse. 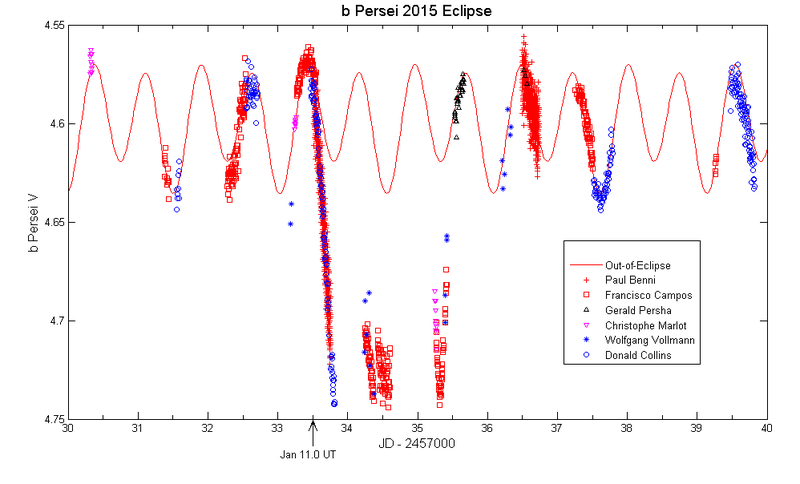 Continuing observations by Collins with a CCD camera have developed an up-to-date light curve for the ellipsoidal variation of b Persei. Collins, Sanborn, and Zavala presented these results at the 2014 joint AAVSO/SAS meeting in preparation for the predicted January 2015 eclipse. In AAVSO Alert Notice 507, we issued a request for observations of b Persei on their behalf, in hopes of catching it in the act of eclipsing. The results of the AAVSO campaign are already in, and they are spectacular! Six different AAVSO observers obtained data during the two and a half days that the system was in eclipse, including all of the eclipse ingress and part of the egress. The participation of the world-wide community was critical to obtain data at multiple longitudes, filling in important parts of the light curve. Collins used out-of-eclipse data from six different AAVSO observers to determine zero-point offsets for everyone to create the eclipse light curve shown below. The solid red line is the predicted light variation of the inner pair, and the data between JD 2457033 and 7036 clearly show an eclipse of nearly two-tenths of a magnitude. Collins, Zavala, and team member Jason Sanborn (Lowell Observatory) are now analyzing the photometry and developing models that explain what the observers saw, but we can already say that the observing campaign was a clear success, thanks to the AAVSO community. We'd like to extend our thanks to all of the observers who responded to this campaign, and to all of our observers who consistently participate in AAVSO campaigns, and help drive astronomical research forward. This research couldn't happen without you!